Lose all track of time, only to glance at a calendar one day and realize Christmas and Hanukkah are only a few days away. Realize you no longer have time to make multiple kinds of cookies for a single holiday; in fact you really need a cookie that does double duty. Find a huge bag of shredded coconut that NOW Foods sent you in a previous life (a month ago, before kid was born). 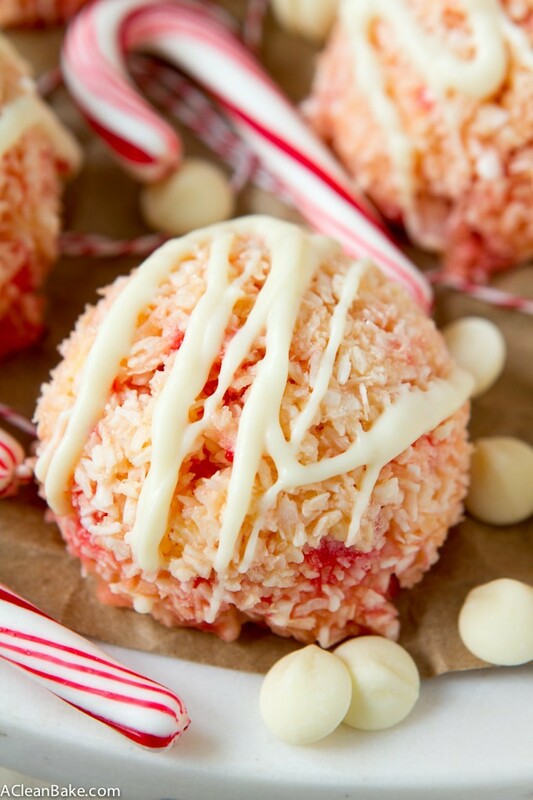 Make a macaroon because it’s rich and decadent and fun to eat, full of everything you need to make a cookie a holiday cookie (chocolate, peppermint, bright colors), and none of the things that various members of your family can’t eat (gluten, dairy, grains). 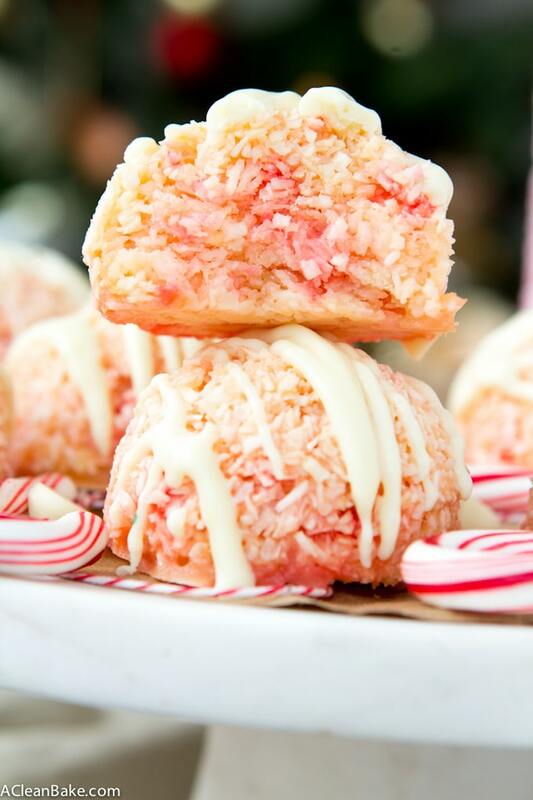 Declare the peppermint macaroon a Miracle Cookie. So I’m back. Well, starting to be, anyway. My son is 3 weeks old and all of the people who warned me that the days are long but the weeks (years) are short were absolutely right. Like so many other things (I’m looking at you, Rock & Play and bandana bibs), I didn’t know just how right until I had a baby of my own. It’s not that I am busy or tired; I’m pretty used to being exhausted and frantic and Baby Bake isn’t a terrible sleeper so far, so we’ve been able to make it through the day. The biggest adjustment – besides the realization that my socially-acceptable days of being able to wear stretchy pants in public are numbered – has been the frequency with which a baby needs things throughout the day. I get it; he’s a baby. But I am so accustomed to working in long stretches with little regard to time or the outside world, especially when I am in the kitchen. Now, it feels like by the time I get the baby to sleep, shove some food in my mouth, clean up the kitchen and get ready to bake, he’s waking up and needs me again. The most shocking part for me about having a baby is how abruptly and extraordinarily my identity has changed. I went from a busy, independent professional to a milk machine at the beck and call of a tiny dictator. I don’t mind it, but it is an adjustment. It feels good to take a tiny step back toward normalcy again, even if it took me four days to make, photograph and write this post. We’ll get better. But just the idea that I am starting to find a happy medium between the old and new version of myself is pretty exciting, even if only just for me. But for you, there are cookies! They’re as easy as can be and, in keeping with the recent trend of only being able to accomplish things that take 90 or fewer minutes, won’t take too much time out of your already-busy holiday prep days. These are the perfect one-size-fits-all cookie for Christmas and Hanukkah. They're decadent and wintery, but naturally free of gluten, grains, and dairy! Preheat the oven to 250F. Line a baking sheet with parchment or a nonstick pad and set aside. In a large mixing bowl, toss together the coconut, stevia and salt. Set aside. In a small bowl, beat the eggs and whites together. 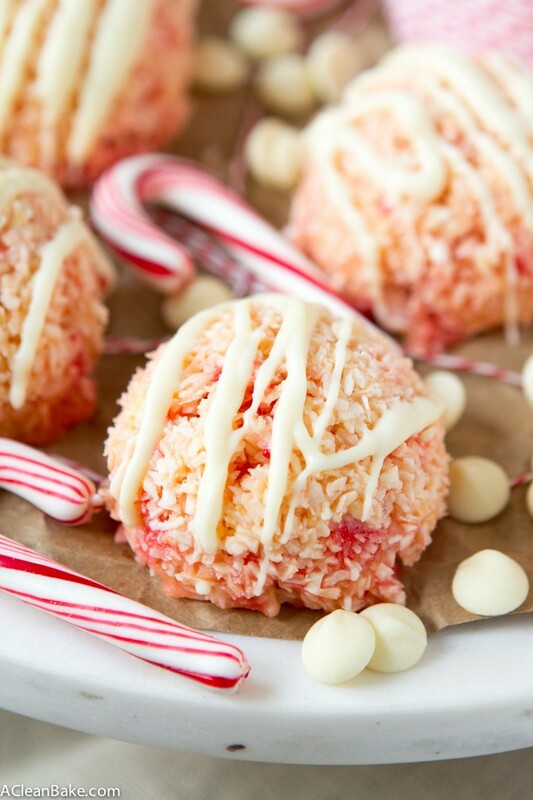 Stir the egg mixture and the peppermint extract into the coconut mixture. 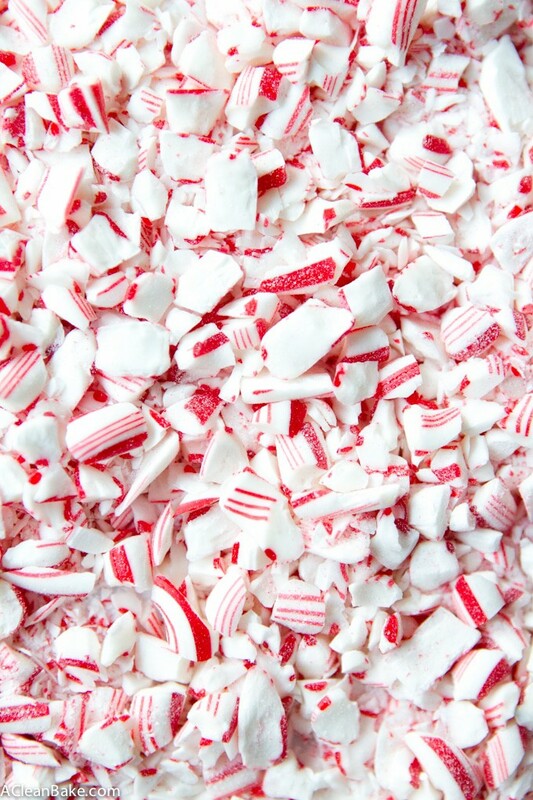 Fold in crushed candy canes. Scoop 2 Tablespoon portions and press into a firm ball. Place on the cookie sheet and gently press down to create a flat base. Bake for 50-60 minutes until firm. Cool for 5-10 minutes on the sheet before transferring to a wire rack to cool completely. Once the cookies are cool, melt the white chocolate over a double boiler, or in the microwave in 30-second increments (stir in between) until smooth. 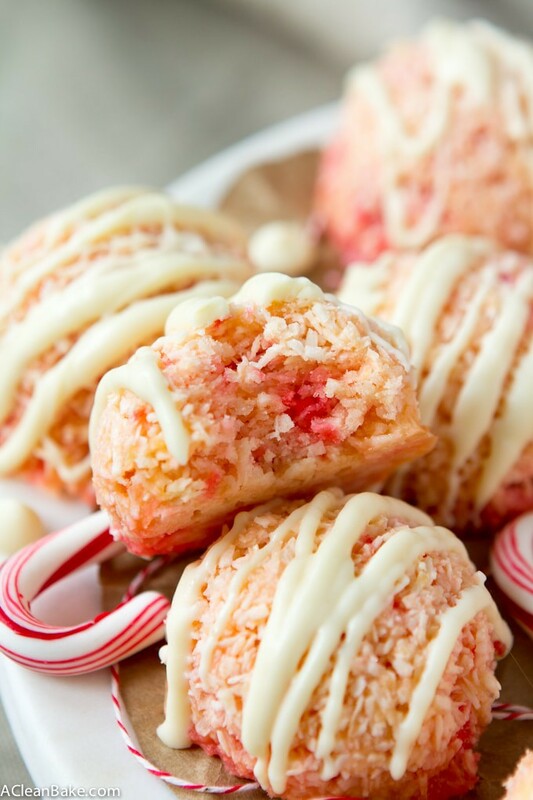 Use a spoon or a zip top bag (see note) to drizzle the white chocolate over the cookies. Allow chocolate to harden before serving. 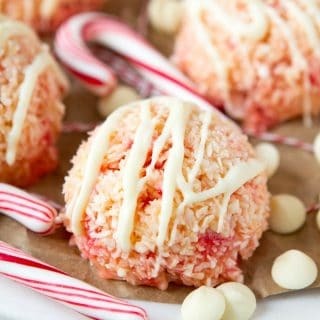 For an entirely sugar free version of these cookies, omit the candy canes and the white chocolate drizzle. Increase the peppermint extract to 3/4 teaspoon or to taste. To make a zip top bag into a pastry bag: pour the melted chocolate into a zip top bag and squeeze it over to one side. Seal the bag completely. Use a clean pair of kitchen scissors to snip the corner of the bag off. Using even pressure (if any) move the bag quickly and evenly over the cookies to squeeze the chocolate out, creating a drizzle over each cookie. Store leftovers in an airtight container at room temperature for up to 3 days, in the fridge for up to a week (return to room temperature before serving) or in the freezer for up to 3 months. 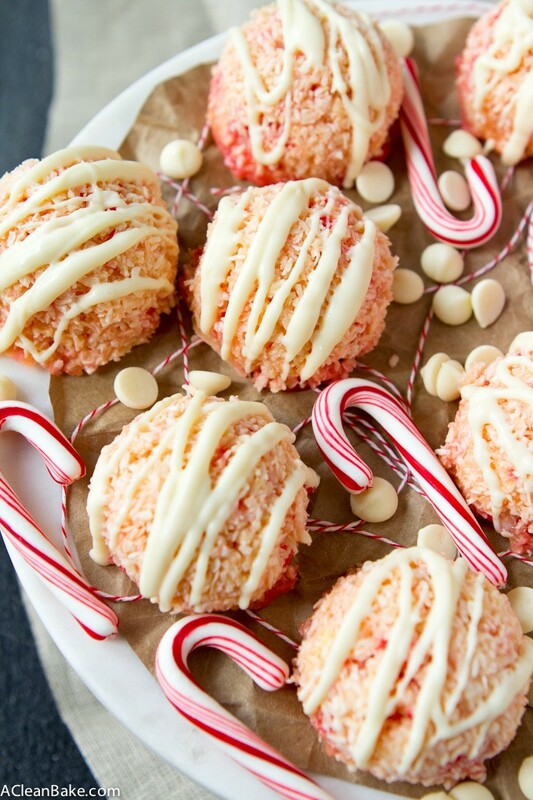 Coconut macaroons are my favorite and these looks perfect for the holidays! I’m happy to hear that all is well with Baby Bake – enjoy the holidays!! I adore this color. These are just so pretty!